Top income stocks Visa, Inc., Valero Energy Partners, 3M Co., and UnitedHealth Group may reward investors with increasingly larger dividends. Looking for a little more income in your portfolio? If so, you might want to consider buying shares in Visa Inc. (NYSE:V), Valero Energy Partners (NYSE:VLP), 3M Co. (NYSE:MMM), and UnitedHealth Group (NYSE:UNH). All four of these stocks reward investors with dividends, and each has catalysts that could support dividend growth in the future. Read on to find out if these stocks should be in your income portfolio. Brian Feroldi (Visa): I've been paying with credit and debit cards for so long that it's hard for me to image life without them. That's why I was amazed to learn that roughly 85% of global transactions still occur using cash or check. Given the convenience and security benefits of using electronic payments methods, I'm confident this number will continue to drop over time. If you agree, you should seriously consider joining me as a shareholder of Visa. Visa owns and operates the largest credit card payment network in the world. With more than 2.5 billion cards in circulation, Visa's platform processes more than 100 billion transactions each year. That greatly benefits the company since it takes a small commission for every successful transaction that occurs on its network. That's why Visa is expected to bring in more than $17 billion in revenue for 2016. What makes Visa such a compelling investment idea is that its platform greatly benefits from increased scale. It costs the company next to nothing to process one more transaction, so each incremental swipe is highly profitable. That dynamic has allowed Visa's margins to consistently rise over time. When combined with the company's habit of buying back huge amounts of stock, Visa's EPS growth has vastly outpaced its revenue growth for years. With the shift to plastic still in its infancy, I think Visa can continue to run this simple playbook with great success for the foreseeable future. That sets the company up nicely to deliver years of dividend growth and capital appreciation to its shareholders. Matt DiLallo (Valero Energy Partners): Logistics MLP Valero Energy Partners has grown its payout every quarter since going public in 2013. Driving that growth are drop-down transactions with parent company Valero Energy (NYSE:VLO). For example, last year, Valero sold $565 million of assets to its MLP, which bolstered its annualized earnings by $67 million. That rising cash flow enabled Valero Energy Partners to increase its distribution by 5.6% this quarter. However, even with that increase, there's plenty of growth left in the tank at Valero Energy Partners. In fact, the company is targeting 25% distribution growth this year, and at least 20% growth next year. Supporting that growth is the fact that Valero still has about $1 billion of MLP-eligible earnings available for future drop-down transactions. Further, Valero Energy Partners can also build or buy additional assets to supplement that growth, and it just spent $70 million to acquire a stake in a recently completed third-party pipeline supplying oil to one of Valero's refineries. In other words, it should not have any trouble meeting its distribution growth targets, making it an excellent income growth stock to buy. Neha Chamaria (3M Co): If you haven't found 3M's 2.5% dividend yield lucrative yet, you should check the terrific growth in the conglomerate's dividends over the years. 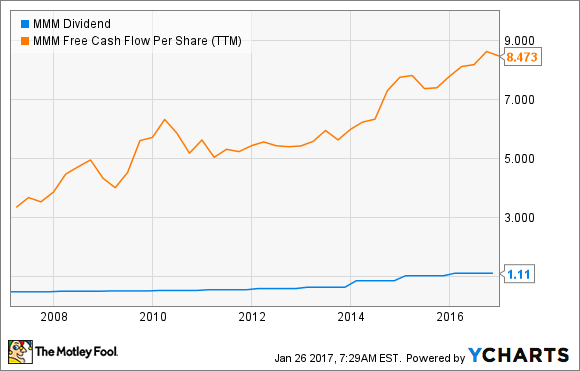 3M is a well-diversified company that has raised its dividends for a whopping 58 straight years and has no intention of stopping whatsoever. During its just-released fourth-quarter and full-year earnings call, 3M management confirmed that it expects to grow its dividend "in line with earnings over time." 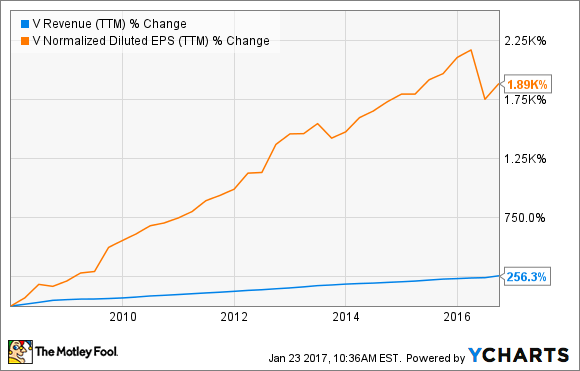 Now consider that 3M grew its earnings per share by around 8% in 2016, converted 100% of its net income into free cash flows, and foresees 4% to 8% growth in EPS in 2017. In other words, investors can expect at least a 4% dividend hike coming their way soon. Psst...3M usually announces dividend increases during the first quarter. In fact, management could turn a lot more aggressive about dividends in the future given the rapid rise in 3M's FCF per share in recent years and its low FCF payout. As a company with 100,000 patents and a diversified product portfolio that serves nearly every industry today to generate as much as $30 billion in sales every year, 3M has its growth catalysts in place. As the company puts its competitive advantages to use and expands its bottom line and cash flows, shareholders can watch their dividend checks get fatter by the year. Todd Campbell (UnitedHealth Group): Undeniably, there are big changes coming for health insurance in 2017, but generally speaking, I believe those changes will be a net positive for UnitedHealth Group. UnitedHealth Group is the nation's largest health insurer, and while it was a big player in Obamacare in 2016, losses from Obamacare plans led to it significantly ratcheting back exposure to the marketplaces in 2017. Because UnitedHealth Group decided to exit the exchanges long before last year's elections, there's a good chance it's ahead of peers in preparing for any disruptions tied to Obamacare's repeal. UnitedHealth's exit from Obamacare means it won't have to navigate Obamacare profit headwinds this year, and as a result, management is forecasting that earnings per share will grow by 15.5% in 2017, or more than twice its expected revenue growth. Admittedly, Obamacare's repeal might not be all good news for UnitedHealth. If changes in federal funding result in states abandoning Medicaid expansion, that could hurt results in the company's community and state business segment. However, I think some states could maintain expansion, and rising demand from other parts of its business, including Medicare Advantage and commercial insurance, should be able to offset any declines in Medicaid. Overall, UnitedHealth's stands to become more profitable this year, and since its dividend payout is only 31%, I think there's plenty of opportunity for that profit growth to result in investor-friendly dividend increases.